One of my favorite homey comfort foods is shepherd’s pie. Reminds me of my childhood and all the yummy home-cooked meals my mom was always cooking. 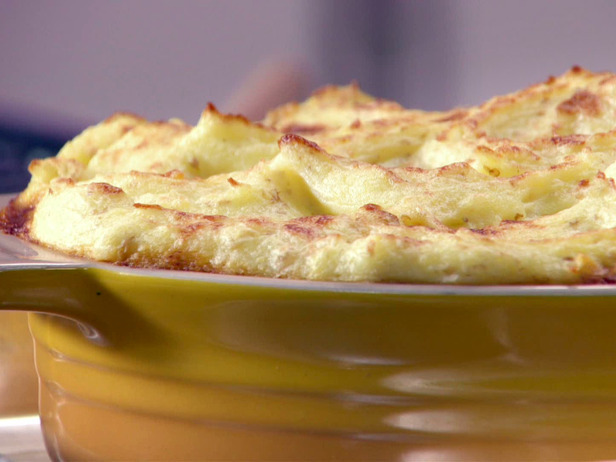 But let’s face it – most shepherd’s pie recipes are full of fat and carbohydrates. Not conducive to someone trying to lose weight or maintain a healthy weight! So I made it my personal mission to come up with a healthier version that my clients and I can all enjoy. First thing I did was eliminate the potatoes and replace them with my favorite go-to veggie these days … cauliflower! This is what I came up with, and I hope you’ll enjoy it! In a large skillet, cook the meat over medium heat, stirring occasionally, until brown, about 5 minutes. Transfer the meat to a plate. Drain any fat remaining in the skillet. Heat the oil in the skillet over medium heat. Add the onions and celery and cook, covered, until the vegetables begin to soften, about 3-5 minutes. Raise the heat to moderately high. Add the mushrooms and thyme and cook, uncovered and stirring occasionally, until the mushrooms are soft and their liquid has evaporated, about 5-8 minutes. Return the meat to the pan. Add the crushed crackers and cook, stirring, for 2 minutes. Stir in the broth, 1/8 tsp of the salt and 1/8 tsp of freshly ground pepper and bring to a simmer, being sure to scrape up any brown bits from the bottom of the pan. Stir in the beans. Pour the mixture into a 9×9 baking dish. Preheat the oven to 350 degrees F. Arrange the cauliflower in a steamer basket, and steam for 10 minutes. Add the cream, feta and remaining salt and pepper and mash with a potato masher until smooth. Spread the “potato” mixture on top of the meat and bake until heated through, about 25 minutes. Is that the picture of the actual casserole? because I didn’t get that much cauliflower on top…it just barely covered the meat but maybe 1/16th of an inch…delicious, but not near as much as your picture shows…or maybe you used a smaller pan? ooops! typo…*by maybe 1/16th’ not but….